After Varaha temple, we moved on towards the King's Balance. 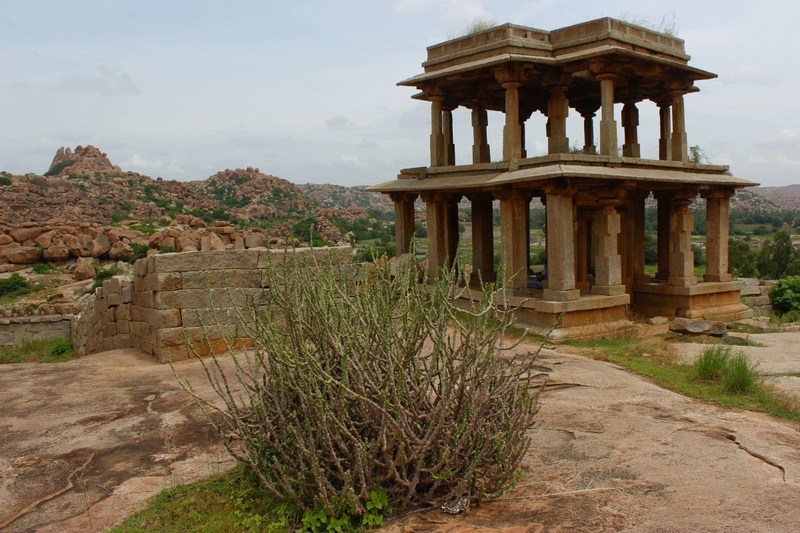 Enroute, on the slopes of the rocky hillock is an enclosure with a temple and 3 mantapas. This enclosure is said to be Vysaraja's Matha- a Vaishnavite monastery. 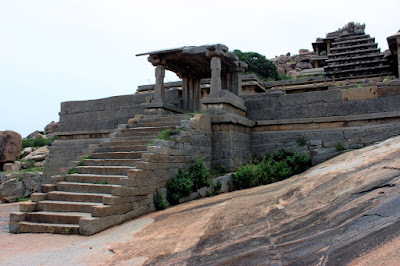 Vyasaraja (1460 to 1539 CE), also known by the names Vyasatirtha, Vyasaraya and Chandrikacharya was a Dvaita scholar and poet. 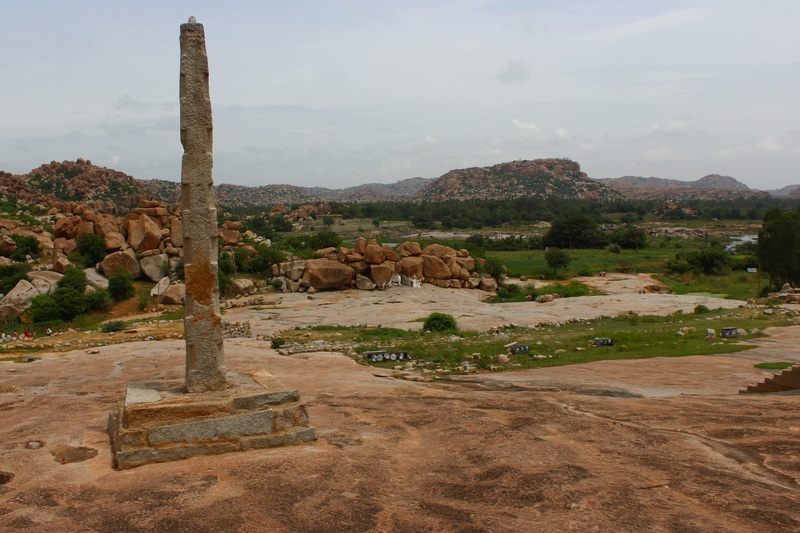 He was the patron saint of Vijayanagara empire. Vyasaraja was received by king Saluva Narasimha at Chandragiri. 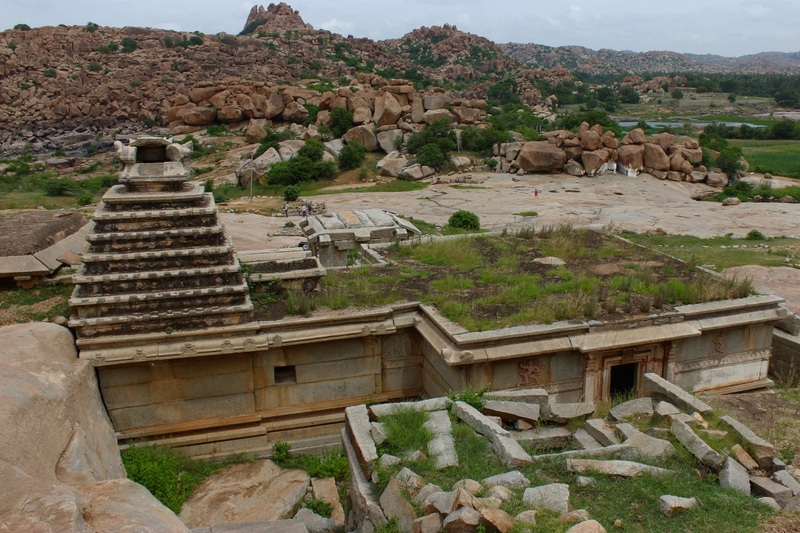 During Krishna Deva Raya's rule, when Hampi became the empire's capital Vyasaraja was appointed as the Rajaguru. After the death of Krishna Deva Raya, Vyasatirtha continued to advise Achyuta Deva Raya. 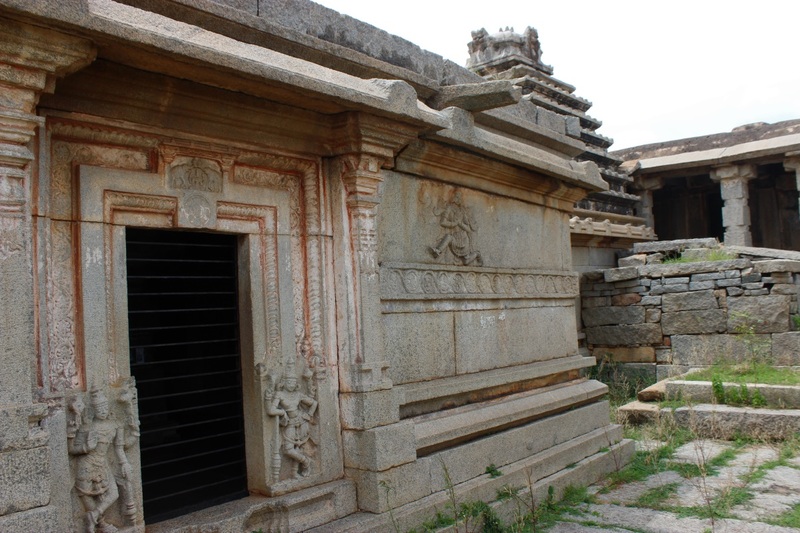 Vyasaraja's mortal remains buried at Nava Brindavana along with the remains of eight other Madhwa saints. A flight of steps takes you to the portico and gateway to the enclosure. The enclosure is bound by fort like stone walls. Builders made sure the religious center was well secured. A stone's throw away is a Stambha.. not sure what to call it ..Garuda Stambha or Vijaya Stambha. In the background is a hill on the horizon, that's Anjanadri Parvata. This is the only temple of the enclosure. The structure is aligned to south-west - north-east direction. It has two doors on its sides and a stepped Shikhara over its Garbhagudi. 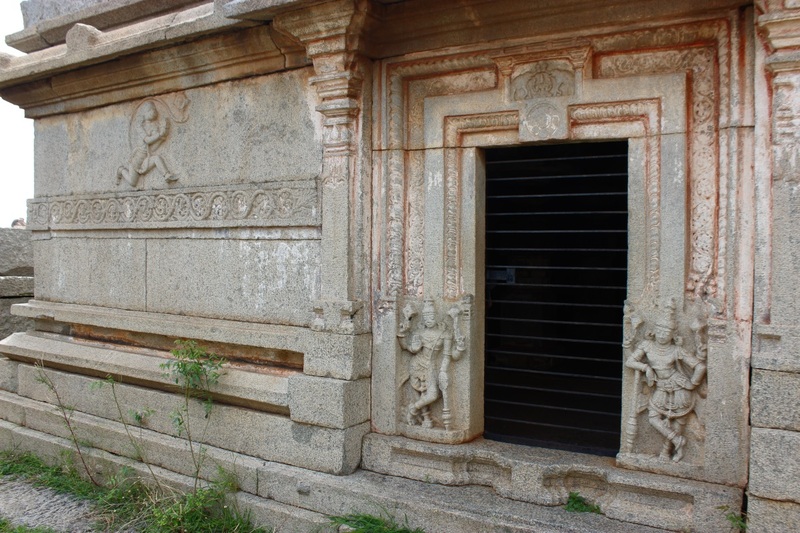 Its outer walls are quite plain except for images of Garuda, Hanuman and floral motifs. The door frame is graced by Gajalakshmi and a pair of Dwarapala. The enclosure is closely packed with narrow paths to move around. On the other side of the temple is a mantapa on a platform and right besides is a flight of steps rising up to a two-storey mantapa. View of the temple from the base of the Mantapa. Behind the temple is another simple mantapa. Lot of sheltered spaces were created for inmates' convenience. At the center of this picture is a shallow valley and a group of rocks. Few rocks are painted red and white - the cavern formed by the rocks is said to be Sugreeva's cave. The two storey mantapa is quite similar to the mantapa on Hemkuta hill but much smaller. 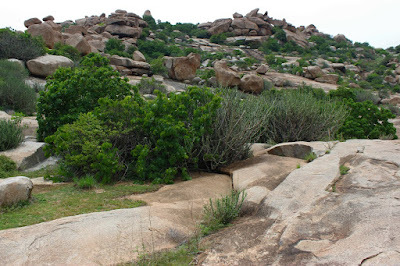 The mantapa offers a clear view of the slopes, the valley below and the neighboring hills. This the hillock's peak. Lot of natural shelters created by the rocks. Naturally the caverns here would be home to wildlife like boars, porcupine, bears, and what not. That explains the need for walls around the monastery. Of course, the greater danger would be human beings. The structural designs are same in their constructions ..be it Hampi, Penukonda, Midigeshi, Mulbagal, or any other place. Its amazing how the buildings across a wide area are same. Standard designs and processes are not modern inventions. 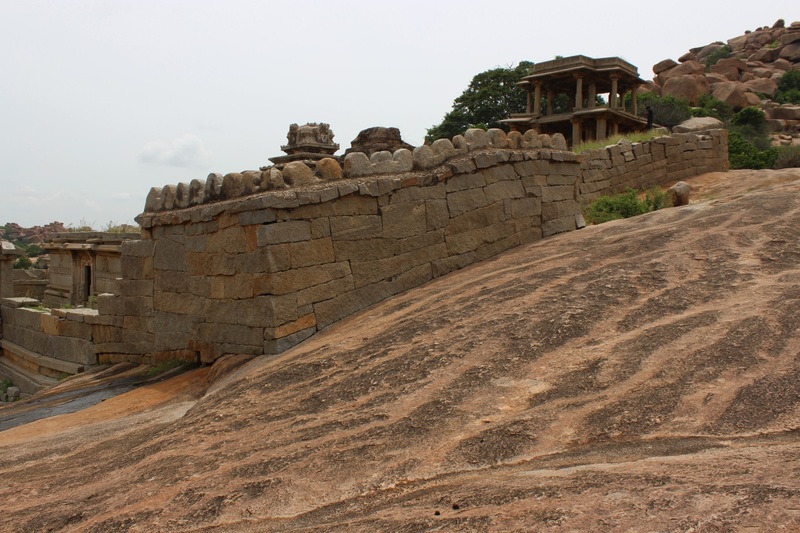 Among his achievements Vyasaraja is known for installing several hundred images of Anjaneya across Karnataka. The two I know of are at Hanumana Kote near Lalguli and Yantroddhara Hanuman at Hampi. From here, we move on to the King's Balance which is close to Vittala Temple. And once again nice pictures of this wonderful little site in Hampi. 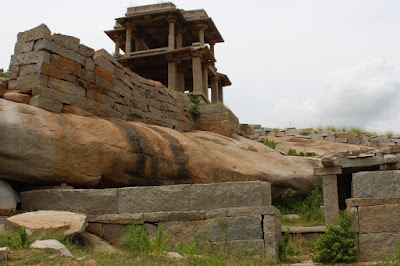 I had visited this in 2005, the only time I ever saw Hampi. 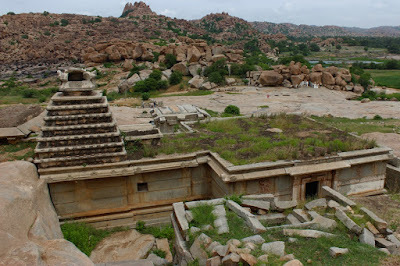 For this particular structure, after seeing so many other sites around and the overall layout/distribution of structures at Hampi, if you start to think of where people actually "resided" and moved during a normal day, I have a question. In your opinion and thinking, what is more likely the entrance to this little complex? 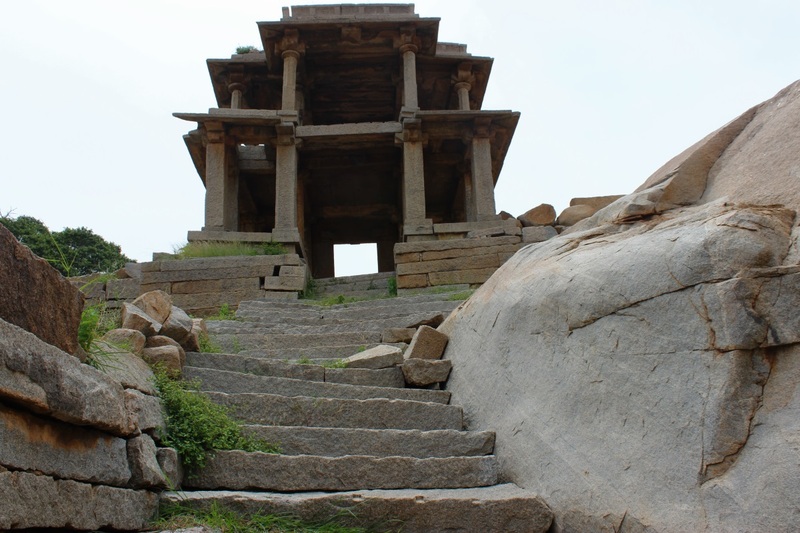 Usually, today, we come from that flight of steps and the little portico, compared to the mantap on the upper side. It makes us naturally assume it to be the entrance. While the mantap is much larger and seems like a more "importantly" done entrance. Compare this mantap, like you have compared, to the other mantaps and how they relate to those complexes. Today, the upper side seem wild, in its days it may have had wooden houses that disappear without a trace. I have enen more curious thoughts: Is this complex oriented to the river, while catering to the entrance? Or, is the complex oriented to the entrance/mantap side and also catering to the river access? Or it does both? Why is the mantap two storeyed at that location? How did the complex grow in its function? Was the temple the starting point, and matha later, think, why is the stone column outside? Or was it the mantap that came first? Or was it the matha, with temple and mantap getting added later? I would like to try to seek answer to these, find contradictory and strengthening clues at site - the facts - to get to some understanding. This is the thrilling part of history in situ. Would love to hear your thoughts. Beautiful structures, and beautifully captured by Siddeshwar. 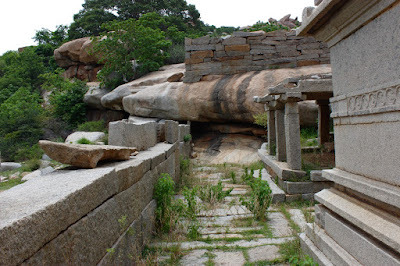 Tempting to visit and spend sometime in Hampi, if I visit India I try my best to visit these places. Beautiful post, Nuggikeri Hanuman temple in Dharwad believed to be by Sri Vyasaraja. @ Nikhil - your words have evoked lot more thoughts. this site is quite intriguing! 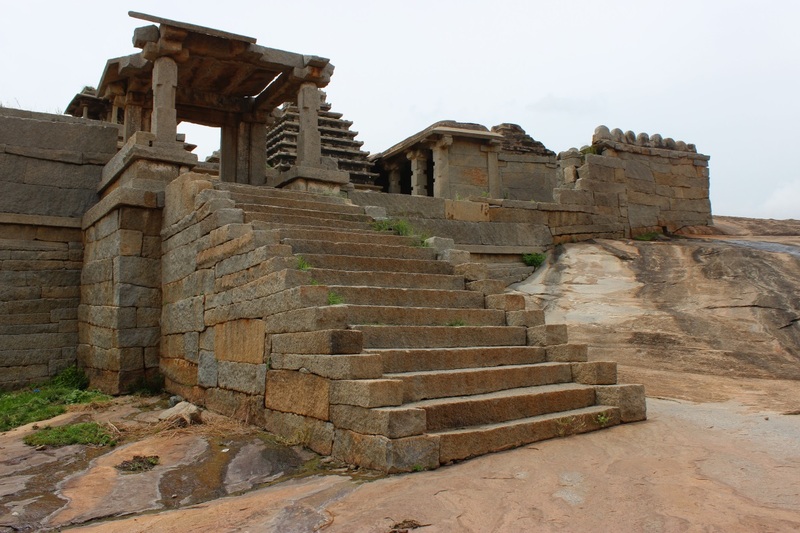 the two-storey mantap seems to be the entrance to the site while the other gateway could be the rear side. normally gateways and main temple are at one level or the latter would be at a higher level. also the orientation is atypical - south-east to north-west. typically sites / buildings are made to face east, north or north-east. today the lower side, with a flight of ascending steps seems like the main entrance. coming to the temple garbhagudi, it faces north-east. it seems the entire site (gateways, mantaps, temple and protective walls) was planned and built the way it is, meaning there was no later additions. i think the mantaps were used as residences, may be the sides were covered with screens made of coconut leaves or thatiningu leaves or hay during rainy season and winter. an open structure would've been preferable for summer time. monks are known to possess few personal belongings, so they would have managed with whatever space was available. wondering what their food habits were, did they cook food, did they store grains, did the matha have cattle.. so many questions.